I've been at the Calvin Worship Symposium for the past few days. The symposium, hosted by the Calvin Institute of Christian Worship has been an annual event at Calvin College since 1987. With my good friend Andrew. 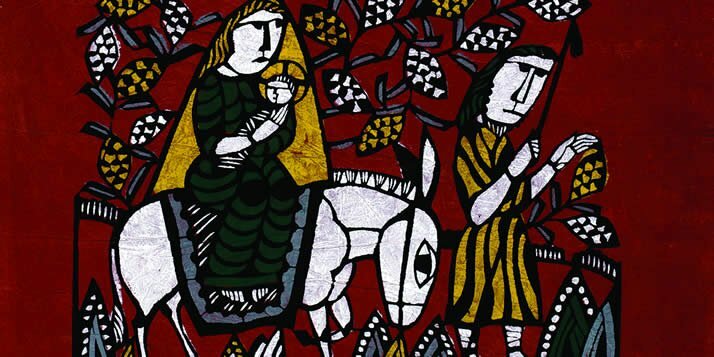 "Flight to Egypt" by Sadao Watanabe is a hand colored stencil print that is part of the "Beauty Given By Grace" series. I recorded this arrangement of the Aaronic blessing at a Jazz Vespers service on the second day of the conference. Written by Tom Jennings and performed by the worship team of Tom's home church, Redeemer Presbyterian Church in New York.